Hearing is critical to the development of speech and language skills as it is through listening to others that children learn how to pronounce sounds and words how to pace their verbal speech, and how to use correct tone, pitch and cadence in their speech. If children cannot hear these cues, they are often left unable to successfully navigate verbal speech production on their own. There are many different types of hearing loss, and many different degrees as well. If hearing loss is severe enough to limit verbal communications, a variety of augmentative and/or alternative communications may be employed instead. There are three main types of hearing loss. Conductive hearing loss occurs when sounds are not conducted efficiently from the outer ear canal to the eardrum and the middle ear. This usually results in muffled hearing and an inability to hear low or faint sounds. Usually this type of hearing loss can be corrected with medicine (for example, in the event that it was the result of an ear infection) or surgery (for example, in the event that it was the result of a physiological malformation in the ear). Sensorineural hearing loss happens when the inner ear and/or the nerve pathways from the inner ear to the brain are damaged. 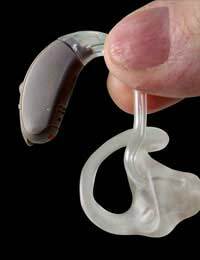 This type of hearing loss reduces sound levels as well as the ability to hear others’ speech clearly. Finally, mixed hearing loss occurs when both conductive hearing loss and sensorineural hearing loss are present at the same time. The severity of hearing loss experienced is referred to as the degree of hearing loss and is measured in decibels. There are five degrees associated with hearing loss, and an individual’s categorisation depends upon the faintest sound that the individual can hear. Normal range of hearing is defined as 0dB – 20dB. Mild loss is defined as 20dB – 40dB. Moderate loss is defined as 40dB – 60dB. Severe loss is defined as 60dB – 80dB. Profound loss is defined as 8dB or more. If an individual is diagnosed with hearing loss, the professional who makes this diagnosis will likely plan a type of treatment or arrange for alternative and/or augmentative communication methods by which the individual will be able to communication with or without verbal speech. Speech therapy may be advised if an individual can verbally communicate, and augmentative communication methods such as adding gestures or obvious body language may help with efficient communication as well. Learning sign language or employing communication aids may also be means of supporting verbal speech, but they may also be means of replacing verbal speech too. Further information on hearing loss, augmentative and alternative communication can be obtained from an organisation dedicated to deafness and hearing loss, such as the Royal National Institute for the Deaf (RNID) (www.rnid.org.uk).